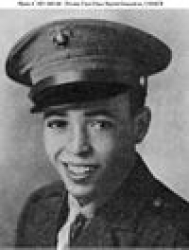 Private First Class Harold Gonsalves (28 January 1926 - 15 April 1945) was a U.S. Marine who sacrificed his life to save fellow Marines in the Battle of Okinawa during World War II. For his heroism, he was posthumously awarded the U.S. military's highest award for valor, the Medal of Honor. Harold Gonsalves was born in Alameda, CA, on 28 January 1926. 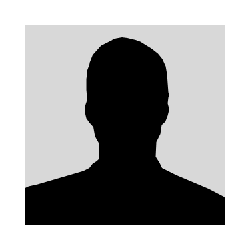 He attended school at Alameda and, after two and one half years of high school, quit to take a job as a stock clerk with Montgomery Ward in Oakland. In high school he participated in football, baseball, track, and swimming; he also sang tenor in the school glee club. Gonsalves enlisted in the Marine Corps Reserve on 27 May 1943 and was called to active duty on 17 June 1943. He went through recruit training at the Marine Corps Recruit Depot, San Diego, CA, and then, at his own request, was sent to the Raiders at Camp Pendleton, CA. After three weeks, he was transferred to the artillery at the same camp. He was classified as a cannoneer on 75 and 105 millimeter guns before he joined the 30th Replacement Battalion in the fall of 1943. Gonsalves left the U.S. on 8 November 1943 and at the end of that month was assigned to the 2nd Pack Howitzer Battalion, which was then in Hawaii. He was promoted to Private First Class in March 1944 and, with his battalion, became part of the 22nd Marines two months later. Gonsalves participated in the assault, capture, and occupation of Engebi and Parry Islands in the Marshall Islands. The regiment was cited by Major General Thomas E. Watson, commanding general of Tactical Group I, for their part in the Marshalls' Campaign. From Eniwetok, Gonsalves accompanied the 22d Marines to Kwajalein, to Guadalcanal, back to Kwajelein and Eniwetok, then up to Guam in July where he took part in the liberation of that pre-war American island. After Guam, the regiment returned to Guadalcanal, where in November they were detached from the 22nd Marines and joined the 15th Marines of the 6th Marine Division. It was with this outfit that Gonsalves landed on Okinawa on 1 April 1945. Two weeks later, on 15 April, Gonsalves was a member of an eight-man forward observer team which was engaged in directing artillery fire in support of an attack by the infantry on Japanese positions on Motobu Peninsula. When it finally became necessary for the team to advance to the actual front lines, the officer in charge took Gonsalves and one other man with him. Gonsalves was acting Scout Sergeant of the team. He and the other Marine were to lay telephone lines for communication with the artillery battalion. As the team advanced to the front, they were brought under heavy enemy rifle, grenade and mortar fire. Just as the three had reached the front lines, a Japanese grenade landed among them. It was less than a foot from the three. Without a moment's hesitation, Gonsalves flung himself on the grenade, taking the full explosion. The other two Marines were not even touched by grenade fragments and successfully completed their mission. 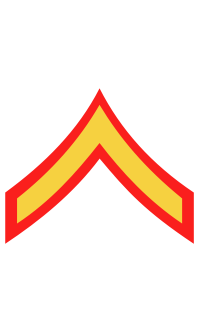 Rank and organization: Private First Class, U.S. Marine Corps Reserve. Place and date: Okinawa Shima, Ryukyu Islands, 15 April 1945. Citation: For conspicuous gallantry and intrepidity at the risk of his life above and beyond the call of duty while serving as Acting Scout Sergeant with the 4th Battalion, 15th Marines, 6th Marine Division, during action against enemy Japanese forces on Okinawa Shima in the Ryukyu Chain, 15 April 1945. Undaunted by the powerfully organized opposition encountered on Motobu Peninsula during the fierce assault waged by his battalion against the Japanese stronghold at Mount Yaetake, Pfc. Gonsalves repeatedly braved the terrific enemy bombardment to aid his forward observation team in directing well-placed artillery fire. When his commanding officer determined to move into the front lines in order to register a more effective bombardment in the enemy's defensive position, he unhesitatingly advanced uphill with the officer and another Marine despite a slashing barrage of enemy mortar and rifle fire. As they reached the front and a Japanese grenade fell close within the group, instantly Pfc. Gonsalves dived on the deadly missile, absorbing the exploding charge in his own body and thereby protecting the others from serious and perhaps fatal wounds. Stouthearted and indomitable, Pfc. Gonsalves readily yielded his own chances of survival that his fellow marines might carry on the relentless battle against a fanatic enemy and his cool decision, prompt action and valiant spirit of self-sacrifice in the face of certain death reflect the highest credit upon himself and upon the U.S. Naval Service. The Medal of Honor, with a citation signed by President Harry S. Truman, was presented on 19 June 1946 to PFC Gonsalves' sister in the presence of his parents at ceremonies in the office of the Commanding General of the Department of the Pacific, Major General Henry Louis Larsen, USMC, in San Francisco, California. In 1958, the Northern Training Area, a U.S. Marine Corps training base located in 20,000 acres of single and double canopy jungle on the northern end of Okinawa, was named after Gonsalves in 1986. Its name was later changed in 1998 to the Marine Corps Jungle Warfare Training Center. Private First Class Harold Gonsalves was killed in action on 15 April 1945 and his body was initially buried on Okinawa. Following the war, Gonsalves' remains were returned to the U.S. for re-internment. He was buried with full military honors at Golden Gate National Cemetery in San Bruno, CA, in Section B, Grave 61, on 20 March 1949.